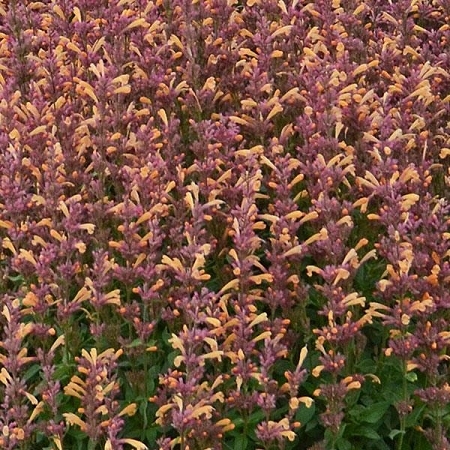 Peachie Keen Agastache (agastache rupestris 'peachie keen') PP25,886 - Also called hyssop. One of the easiest perennials to grow. Heat and drought tolerant. Attracts hummingbirds, bees, and butterflies. Densely compact, rounded clump of aromatic, bright green foliage is topped with loads of apricot-peach flowers with complementary purplish-pink calyxes. Flowers for many months beginning in mid-Summer (earlier in warmer zones). Easy to grow. Can grow to a height of 20". Deer resistant, needs plenty of sun. Perennial zones 6a - 9b. One live plant in 3" container.